At UBT June is all about Dads! 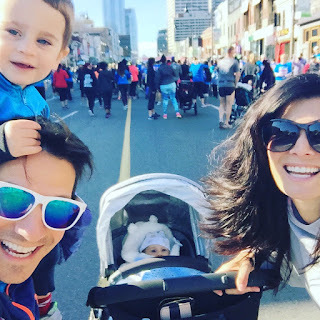 We had the opportunity to chat with Rick Campanelli, on his last day of parental leave. He talked to us about his decision to take four months off work to spend with his family and how he will balance it all when dealing with a work schedule, that's now busier than ever. UBT: So, today is your last day on parental leave. How does it feel? RC: Yes, it's my last day and it has been such a joy. I have loved every minute of it. This is the first time I have done this. I have three boys now. 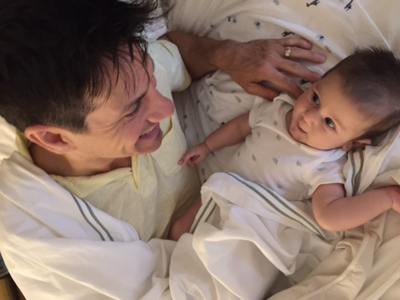 With Noah and Jack, I took a few weeks off each time. But I realized I am getting older and wanted to be there to help my wife, Angie. And then I just wanted to do it for myself as well, just to be with my kids and with my wife. It was the best decision I have ever made. I would have taken the maximum amount of time, but I am joining a radio morning show in Toronto on the 27th and they wanted me to start, like yesterday. UBT: Taking time off work is becoming more popular for dads, but it can be a tough decision for many. Tell us about how you decided to take parental leave with a career in the spotlight. RC: I talked to my wife about it and we decided it was probably the best thing that we can do right now for our family. I am 46. I don’t have as much energy as I did eleven years ago, when Noah was born. It was a no-brainer. It just made sense for us and it was the perfect time to do it. Everyone has been so supportive. UBT: And how do you feel about going back to work? RC: It is exciting, to get back to work, but it is also terrifying at the same time, because it will be a totally different routine now and I will very rarely see my family. That saddens me. I get teary-eyed because I will have to leave the house around 4:30 am and I won’t be getting back home until around 6pm. No longer able to do all those things that I have been doing for the past four months with my wife and boys. I really am going to miss it. UBT: Do you think your experience on parental leave will change your perspective on things, when you do get back to work? RC: I have always been a family-first, type guy. My family is my priority. Work is important and I am going to get my work done, but my family comes first. I know I will always be thinking about them when I am away, because it has been so amazing to be with them and bond with them. And I want to spend as much time with my family as possible. It’s going to be totally different now so that’s going to be a major change. My attitude toward “family first” is getting stronger, as I have more kids. UBT: What would you say to men who might be considering parental leave? RC: If new dads are considering it, I suggest doing it. My advice is to just take some time to be with your wife and your newborn. You really do see the growth. Harrison is four months today, and I have already seen so many changes. I wouldn’t have been able to witness and observe these changes if I was at work. He is smiling and laughing as I interact with him. It is so beautiful. I would have missed out on all that. And then having a two-year-old at home as well has enabled me to bond with him every day, and our relationship is getting stronger. We go out for bike rides every morning - just the two of us. And it’s just so wonderful. So, if guys are considering it, I say: Go for it! You’ll never get these moments - those precious moments - back.